Boston activists confronted billionaire investor Seth Klarman, who sees Puerto Rico's crisis as an opportunity to get even richer, reports James Egaña. 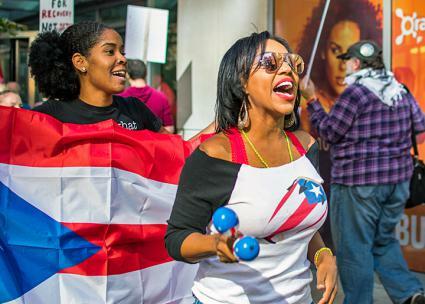 ABOUT 75 people held a picket in Boston outside the offices of the Baupost Group hedge fund to draw attention to how powerful financial interests are preying on Puerto Rico--even as its residents struggle to secure basic necessities such as food and water. The Baupost hedge fund, founded by billionaire Seth Klarman, started investing in bonds issued by Puerto Rico in 2015 when it could acquire them for pennies on the dollar. Baupost's strategy is to use Puerto Rico's subordinate status as a U.S. colony to extract profit from the island, no matter the cost to the people who live there. The value of Puerto Rican bonds owned by Baupost is now about $911 million--but if Baupost succeeds in using political pressure and outright blackmail to get its way, the return on this "investment" could be immense. The picket, organized by the International Socialist Organization (ISO) and co-sponsored by Boston Democratic Socialists of America and the Green-Rainbow Party, called for the cancellation of Puerto Rico's debt--which is precisely what Klarman and Baupost are adamant in opposing. The event started with a short kickoff by ISO member Michael Fiorentino, who explained the reasons for the action and why that location was chosen. Rally participants heard in detail how Baupost is involved in the crisis, and how Puerto Rico has been forcibly molded into a debt colony whose sole value in the eyes of investors is producing capital for the mainland, even if that leaves no resources to provide for its people. Using debt as a lever, capitalism's barons of finance have turned human beings into a commodity. Instead of an influx of funds, the unelected financial junta that governs Puerto Rico has proceeded to slash budgets and freeze hiring and development. Because of this, any process of recovery from the devastation caused by Hurricane María is more likely to make life even harder for the people of the island--while Klarman and his investors get to contemplate how to spend their ill-gotten gains. PASSERSBY GAVE enthusiastic support from their cars, and some on the street even joined the effort to demand a debt-free recovery for Puerto Rico. One person, who had arrived from Puerto Rico only three days earlier, was overwhelmed by the sight of the Puerto Rican flag held aloft by people representing a coalition of local Boston organizations demanding an end to colonialism. To Klarman and Baupost, our message was unequivocal: "¡Puerto Rico no te debe nada!" (Puerto Rico doesn't owe you anything!). Chants included, "¡Seth Klarman, cancela la deuda, si no, te damos candela!" ("Cancel the debt, Seth Klarman, or we'll dog you everywhere you go!") and "Money for recovery, not Seth's salary!" The rally culminated in a speak-out. "I'm angry, I'm frustrated, but I'm not confused," the first speaker began. "The U.S. has fed off Puerto Rico." Laying bare the parasitic nature of the role of the U.S. in this relationship, Nilaya Montalvo, a member of the Boston ISO, continued, "Puerto Rico can't give you what you've already taken." Another speaker expressed how this was a case where the true face of capitalism was revealed. "Systems of oppression are run by people, and one of those people is right here," they said. Montalvo cut to the core of what many were feeling when she said, "Don't confuse fear, stress or exhaustion with lack of will...If we can't sleep in peace, neither will you!" Several people shared how their worries about loved ones in Puerto Rico struggling to get by had affected them personally. "They say we're stubborn because we have the passion they are lacking," said a student at Boston's Berklee College of Music. "We feel for everyone and everything." Again and again, people echoed the theme that Baupost should return to the people the wealth it stole from Puerto Rico. One speaker reminded everyone that Democratic senators in Massachusetts have voted for an increase in the already runaway military budget ($598 billion in 2016 alone) that makes Puerto Rico's debt ($72 billion) look like a pittance by comparison. In a similar vein, another speaker asked why recovery efforts have made so little progress when that same military can deploy functional cities filled with troops almost anywhere in the world overnight--as long as it's for the purposes of military conquest, not humanitarian relief. Everyone who came out seemed to have a sense that this is just the beginning--in more ways than one. With many parts of Puerto Rico still inaccessible and the extent of the damage only starting to be seen, it's impossible to say how long until the full scale of this disaster will even be understood. At the same time, the only statements Klarman has made on the issue don't show an ounce of empathy for the people whose suffering he's profiting from. It's up to us to keep up this fight and demand a just recovery for Puerto Rico. In the days following the rally, city activists have begun planning more actions in order to continue this campaign until our demands are met.